I was relatively laidback in high school when it came to grades. I never got any final grades below a B that I can recall, but I was pretty content with Bs. As were cool, but not something I really stressed about. Now I'm a straight A student, and I stress a lot about maintaining that. There was this study done about neuroplasticity in the depression recently-ish. If you don't know what neuroplasticity is, basically it's this idea that our brains change and adapt. Our neurons form connections with each other which are strengthened by repeated exposure or weakened by lack of exposure to particular things. Anyway, this study found that depressed people have less neuroplasticity, which means they have more trouble adapting (and therefore learning). In a way that can perpetuate depression, because it kind of impedes a person from making new connections/associations. This is why it is pretty useless to tell people who have depression to cheer up or be more optimistic. Their brains just can't make that shift easily. You get stuck in this puddle of pessimism and it's hard to see things any other way. I'm wondering if this neuroplasticity thing affected my grades in high school at all, or if it was just other factors in my life. I was depressed throughout my high school years, but at the same time, that was kind of my "first time" experiencing depression, even if it never really ended for years. I hadn't developed good coping mechanisms yet, so maybe things just affected me more then. Even though I know I've had depressive episodes since high school, in my mind they don't compare to how I felt back then. I don't know if this is just because I've learned how to handle them better or if things really just were worse. In any case, since my second semester of college, I've been getting nothing but As (with the disappointing exception of two A-s). So I guess the (unanswerable) question is, am I less depressed now than I was in high school? And related to that, is my brain more plastic now than it was? Does that factor in to why I'm achieving more? There are too many factors to really know, though. I mean, I'm more motivated now, I guess. In senior year of high school I started getting some esteem boosts from getting good grades and recognition from teachers. (Well, technically it started in junior year I guess, but I think it had a bigger impact in senior year) I work harder now than I did in high school. Back then I would put the minimum possible effort in to get a B. Now I put the effort in to get as close to perfect as possible when I can. My perception of myself has also changed. I don't view myself as inferior to everyone around me anymore. In a (somewhat horrifying?) twist of fate, my classmates perceive me as possibly the smartest person in the class. My school friends routinely check their answers against mine to verify them, and I get asked a lot of questions about our course material. What's weirder to me is that I actually KNOW the answers to most of these questions. In high school my motto could've been "I don't know." Now I find myself telling people that not only do I know, but I can explain it to them so they understand. It's strange to be confident about things. Even though it was over three years ago now, the memory of being confused and fearful is still very fresh in my memory. It's hard to forget being afraid to walk because you don't know if the ground in front of you is real or not. It's strange to feel like I CAN know things. This post is getting kind of ramble-y. And this question is like "which came first, the chicken or the egg?" "Which came first, a brain change or a behavior/perspective change?" Anyway, that's it, I think. There aren't a lot of thoughts I feel are blog-worthy anymore, but this is something I wanted to keep. I keep a list of dream notes on my tablet. It's not comprehensive, since sometimes I don't bother to record my dreams, but it has over eighty dreams in it now. Last night I had a dream that I was in a tiny chapel, the size of a large bedroom maybe, the walls of which were all painted a bleak charcoal grey color. There was an arched wooden double door to my right that led out to a small graveyard out front, and ahead of me was a wooden table with benches where a couple people were sitting. There was no wall behind it, just an open space you could see overcast sky and dead grass from. I bought some sort of service or food and sat at the table, then decided I should give some money to the people around me. At this point I was a man with brown hair and a moustache and a cowboy hat, sort of like Matthew McConaughey in Dallas Buyers Club I guess. My wallet had sixteen dollars in it, but I knew I could take the money out and close it and it would refill itself. Something bad had happened to the world and it seemed like I ought to be generous with my money while it still meant anything. I went into the graveyard as the man, and then I was a different person, though he was still there. He had an axe and he was crazy, he was killing people, he was coming after me. At first I thought he only wanted to kill people with certain characteristics, because he was distracted by someone outside who was a server, but after he had killed everyone in his way he came after me again. I ran out of the graveyard onto the sidewalk, then into the street. He kept following me. I ran along the road for awhile, stopping periodically to try to catch my breath and look behind me. He got closer and closer, and it seemed like he wasn't tiring even though I was. I tried to run in such a way that he would follow me and get hit by a car, but the car that was coming missed him. Occasionally he would stop if I stopped, but if I tried to run in a different direction he wouldn't be tricked and he would cut me off. I did this a few times, and then stopped and tried to run back to where I had come from, but he caught me. I think he killed me. In the future, a group of people (I was a different person, but in the group) got together to try to kill the man who had been terrorizing them for so long. He had killed many of us, but we resolved to end it before anyone else died. Some of us lured him to a clearing near the chapel, and we surrounded him and decapitated him. His head fell to the ground, and there was no flesh in it. It was completely hollow and filled with huge squirming maggots. They began to crawl out of the head and we stomped on them with a mixture of fear and disgust. The leader of the group told us it wouldn't truly be over until we got every last one. 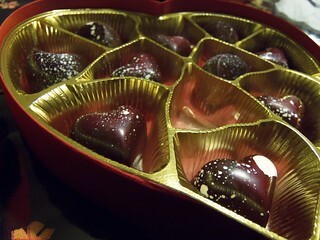 He also bought me a box of chocolates from the market! They were made by a local person and came in two flavors. The heart-shaped ones are passionfruit caramel, and the crescent ones, which I ate all up, were cookie crunch (speculoos). 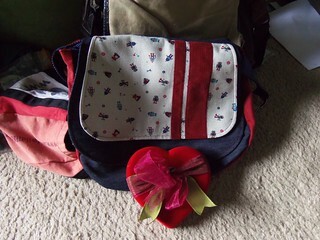 The gifts were very nice, but when he gave them to me he kind of just handed them to me, like "here, I got you stuff." He feels like I don't appreciate his gifts, because although he buys expensive things (which I don't ask for and have repeatedly told him I don't need o_o), his presentation isn't great... I mean it's nice to get things, but it detracts from the experience if the stuff just gets shoved into your hands and then the gift-giver stands there and stares at you expectantly. He often tells me what he's getting me beforehand too, so it's hard for me to feel excited with anticipation, because I know far in advance what the gift is. This kind of used to happen with my ex. It would take him ~7 hours to drive to my house from down south, and I would be really excited for the first two hours or so. Then the night would drag on and I would get kind of tired and the excitement would wear off, so that by the time he actually showed up, I didn't seem to care much, and he would feel disappointed by my reaction. Maybe some people can sustain feelings of excitement for a long time, but I can't. :/ Not if I know exactly what will happen, anyway. I think there has to be at least some surprise or unknown involved, and that's what the actual exciting part is. 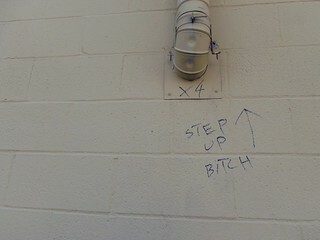 Someone wrote on a wall. 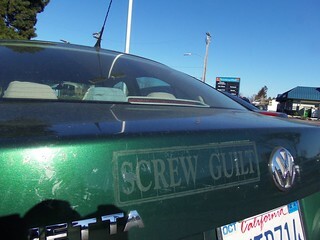 I think this person tried to remove their bumper sticker, which seems ironic. Cici doing her thing, being cute. He used to come out all the time, even when he was supposed to be sleeping. 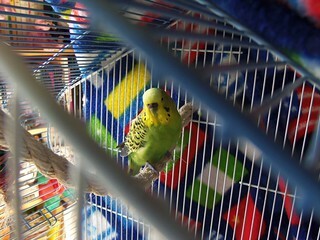 Now, if I take him out, he just goes right back into the cage... I guess he seems healthy, at least. I'm really just making myself feel worse. Romeo is still here with me, I shouldn't be acting like he's already gone. Sometimes the sadness is overwhelming. Luckily it hasn't been too much of an issue at school. My stats professor asked me today after class if I was going to grad school. I said I was probably going to, but I hadn't looked into it that much yet. He told me I had a chance to be valedictorian. I don't know if being valedictorian means that much if your class size is only thirty people. I'm finding it hard to care about school. About almost anything, I guess. I just realized there's a 'small caps' formatting option for this. The editing stuff doesn't work for me in Chrome, so I haven't used any of those buttons in years. Now I kind of wish they worked. I have been worrying a lot about grinding my teeth. I don't know if I do or not, but at my last couple dentist appointments they've said a couple of my molars look too worn for my age. I don't wake up with a sore jaw though, so I don't know what to make of that... They said I could be clenching my teeth while I sleep, too, but it seems like I should be able to tell? Sometimes I wonder if the anxiety over the possibility of teeth grinding could end up making me grind my teeth. The vet thinks it's pretty likely that Romeo has a tumor. They also gave me an extensive list of things I should be doing differently in taking care of my birds... For instance, I shouldn't feed them a seed diet anymore, and I should change their food and water daily and give them showers three to four times a week, if not daily. I'm also supposed to get them sunlight every day for vitamin D.
There's more than that, but I won't list it all here. 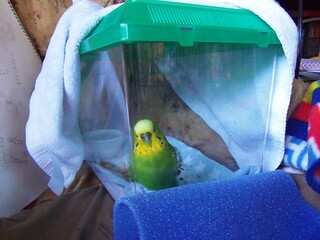 Romeo has to stay in the "hospital box" until I bring him back in eleven days. It's just a clear plastic terrarium, but I'm supposed to keep flannel in it as a bedding for him and change that every day. He doesn't like it very much in there. He's been spending most of his time pressed up against the side, looking out. The idea of the box is that it's helping him to conserve energy that he'd be using for perching. I'm also supposed to have a heating pad set up under half of it to keep him warm, which they said will help him breathe. I can't tell if he can feel the warmth from it or not, since it doesn't seem too warm to me. 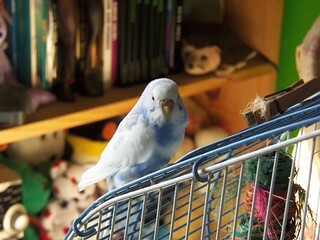 I feel bad for keeping him in there, since it must be very boring for a budgie to be stuck in a box all day, but I hope it helps. 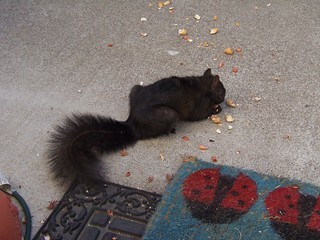 One of the squirrels we feed, Friendly, has been kind of weird lately. We're not sure what happened to him. 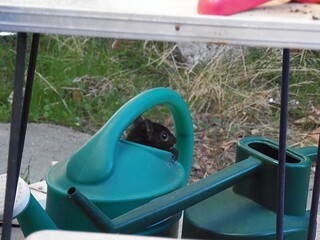 My dad noticed that he was in the watering can in the backyard and thought he was stuck at first. He got out though, and was kind of crawling along the ground and just lying in sort of a hunched posture to eat peanuts. It's been several days since he first started acting weird, but he seems to have improved a little? He won't sit up to eat anymore, though. My dad helped me take Romeo to the vet today. They examined him and he was surprisingly compliant. Usually he gets very upset if he's being held in someone's hand. The vet wasn't sure what the lump was. She said it was possible that he had a tumor, but she had never seen one that looked like that and she thought it could also be a hernia. I didn't realize how big it was before she pushed his feathers away to show me. She wanted to keep him for observation overnight, and said he would stay in an incubator for warmth and they would give him liquids to make sure he was hydrated. It was hard to leave him there but it seemed like it was for the best. I hope he isn't too scared. The incubators looked like microwaves. Altogether, the cost of the visit was over $200. The actual examination was only $70, but the overnight hospitalization and the medication they suggested added on some extra cost. I was afraid that my dad would have issues with the cost, but he said that it was a lot cheaper than what the medical costs for a human would be, and that he viewed it the same way as when my grandma was in the hospital. I felt so relieved when he told me that the money was not an issue when it was for something like this. A couple other people in my life, on the other hand, said stuff that basically amounted to "Well he's kind of old anyway, so it's okay if he dies." I guess that's supposed to be comforting, but it really isn't. And well, of course I know that I will eventually get over his death with time, but it hurts now. Maybe he'll be fine, though. He's always bounced back from illness and injury before. Maybe he's got a few years left in him, even.